In May 2015, ISH released a historical nonfiction book that coincides with our sixtieth anniversary. 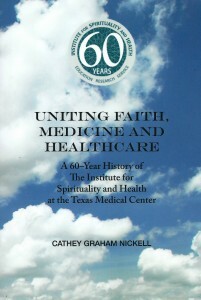 Uniting Faith, Medicine and Healthcare: A 60-Year History of the Institute for Spirituality and Health at the Texas Medical Center, is available for online purchase through Amazon or Barnes and Noble. The book is the first published work of Cathey Nickell, and the project took her more than a year to complete. She conducted numerous personal, one-on-one oral history interviews with long-time supporters of the Institute. She searched through sixty-years’ worth of our board minutes, newsletters, hand-written letters, special event programs, books and other documents in an effort to compile a chronological historical record of our years from 1955 to 2015. The 120-page paperback is $12.00, and the hardcover version is $18.00. All sales proceeds benefit our work here at ISH. If you enjoy the book, please remember to go online and post your reader review at either Amazon or Barnes and Noble.